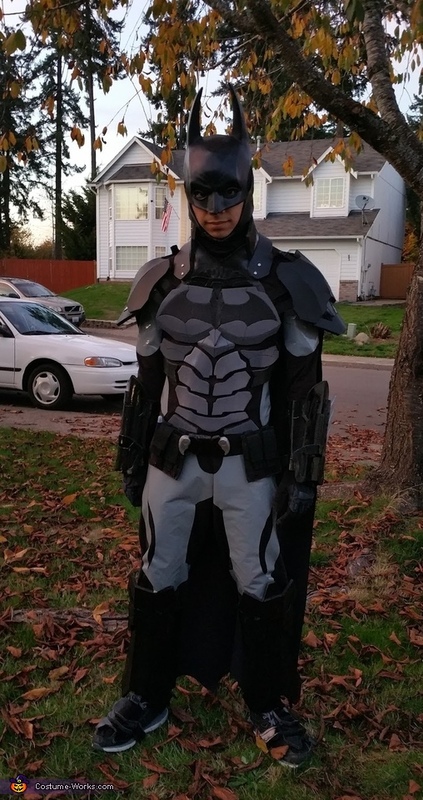 This Batman costume is based off of the popular video game: Batman Arkham Knight V8.04 batsuit that Batman uses to fight off the evil Arkham Knight. The main goal of this project was to make this as accurate to the game as possible which included using materials such as carbon fiber vinyl and mesh materials to highlight key details of the suit. Before I made the costume, I planned it during the fall though various drawings as well as research on YouTube of tutorials on how to use the material such as heat forming the material to form the gauntlets and shoulder pieces. The suit took around five months to make which included creating cardboard templates, sanding off edges of the EVA foam, and modifying a Rubies Batman cowl by adding mesh detailing to create an accurate representation of the cowl from the video game. The costume is comprised of mainly EVA foam for the chest, gauntlets, neck guards, shin guards, and shoe covers. Detail materials for the suit include: grey vinyl, carbon fiber vinyl, different variations of cloth from Joanns, mesh, elastic straps, Velcro, parachute buckles, paper fasteners and a ton of hot glue. Painting materials used were: black Plasti Dip, black and dark grey Rust-Oleum gloss paint, and folk-art metallic acrylic paint. Estimated cost is about $100-$200.